Snow showers will be making a return to the area late Sunday night into Monday. Plan accordingly! The Monday morning commute will be a slick one. Sunday starts off sunny, but clouds will increase and thicken throughout the day. Highs will be in the mid to upper 30s. A few towns and cities, to the south, could flirt with 40 degrees. Our next system moves in Sunday night and Monday morning. There is still some uncertainty with this system. Right now, we're still looking at a light snow accumulation for much of the state. 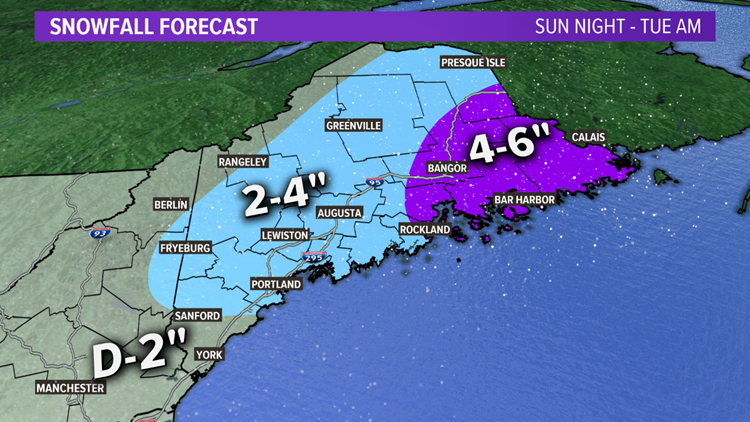 A few mixed or snow showers are possible south of Portland Sunday evening. We're talking after sunset. Most of the state stays dry until after midnight Sunday night. 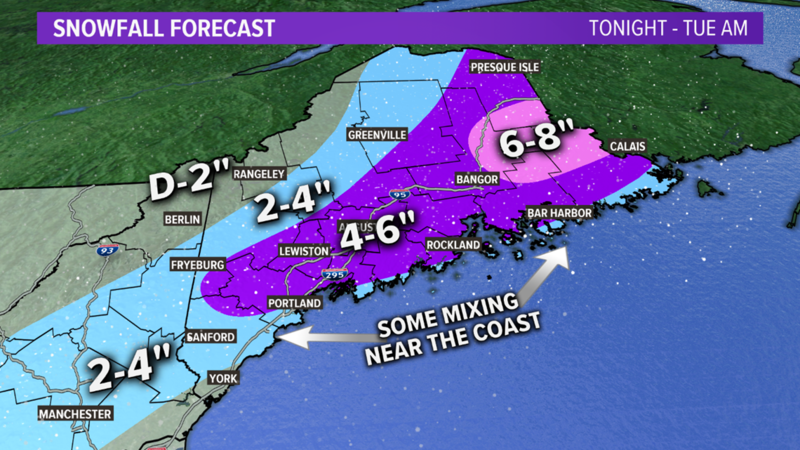 The snow will move north and east overnight, arriving in Augusta around 3 a.m., Bangor around 5 a.m. 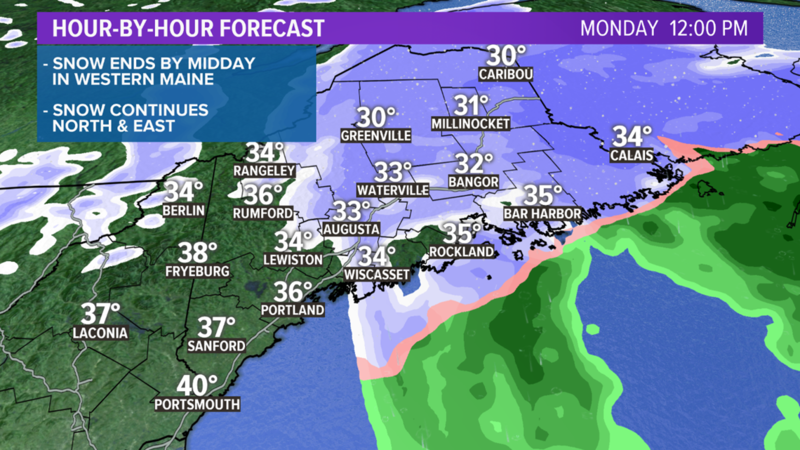 It will be a snowy Monday morning commute in a lot of the state. 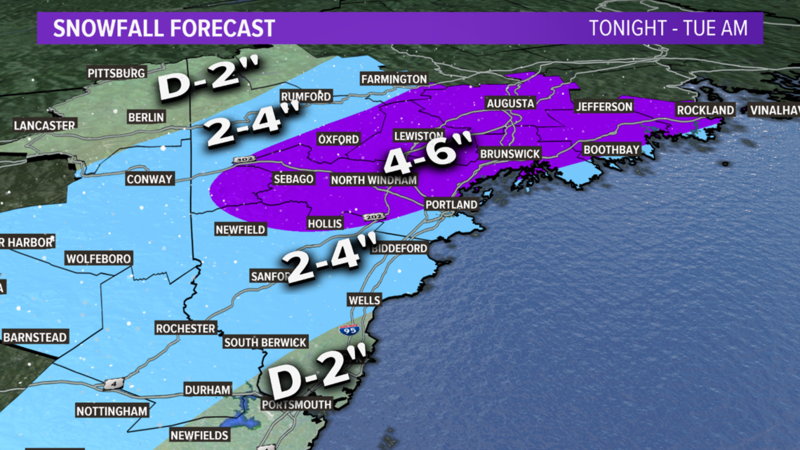 Precipitation begins in southern Maine around midnight, central Maine around 3 a.m., far northern Maine around 6 a.m. It'll be a snowy morning commute for most. Some mixing with rain possible near the coast. Periods of snow will continue into the mid-morning. 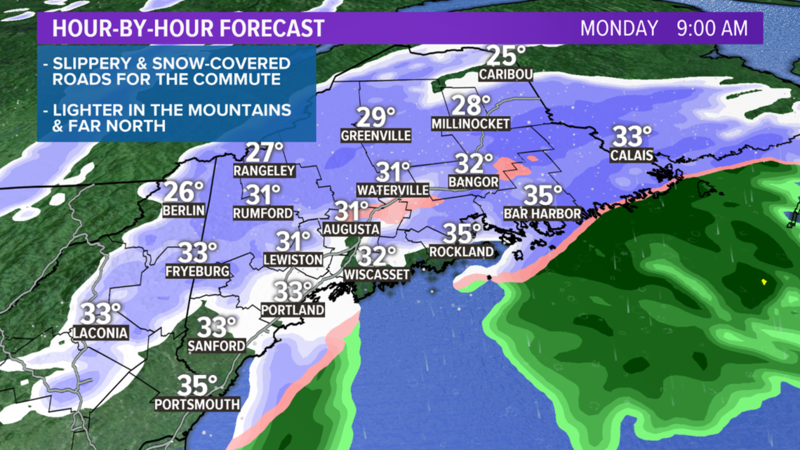 Snow ends in western Maine by midday, but will continue north and east. 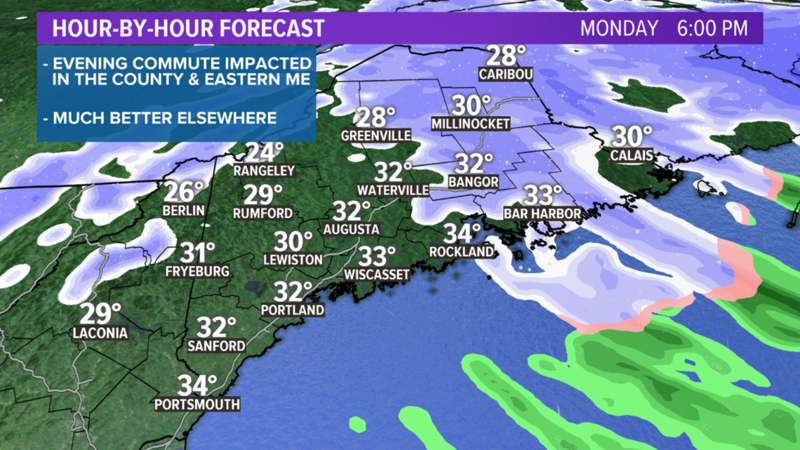 The evening commute will be impacted by periods of snow in northern and eastern Maine. Mostly dry elsewhere. 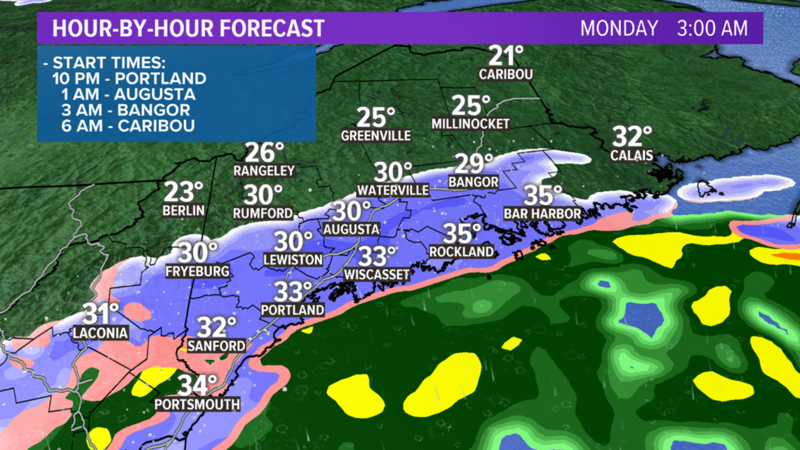 The snow will lighten up in southern Maine during the late morning and midday Monday. 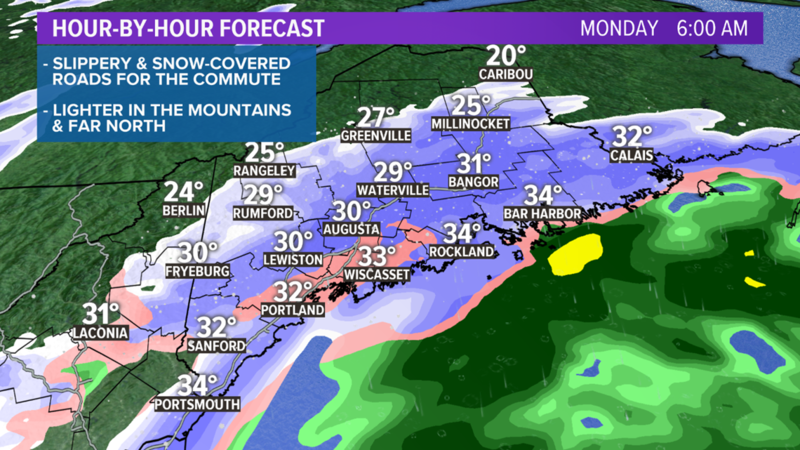 It will linger into Monday night in eastern and northern Maine, where the evening commute will be affected by snow. 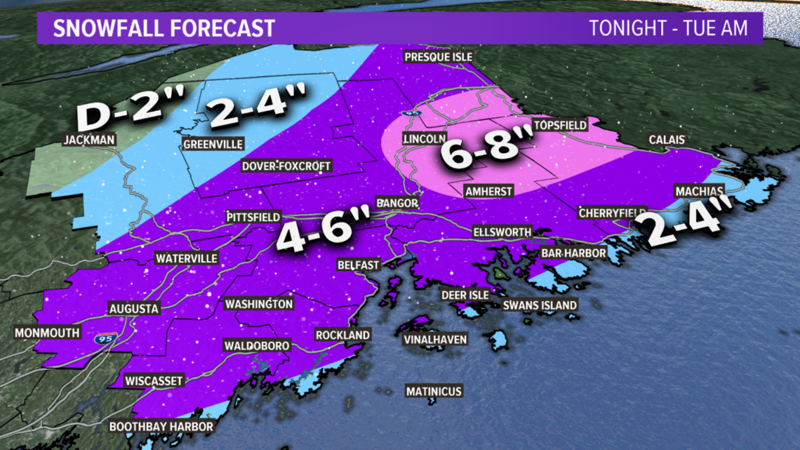 4 to 6 inches are likely. Most of the rest of the state will see between 2 to 4 inches of snow, less in southern York county.